In episode 7, we visit Outstanding in the Field, a “restaurant without walls,” that brings the dinner table to the source—farms, gardens, mountaintops, ranches, and even sea coves. 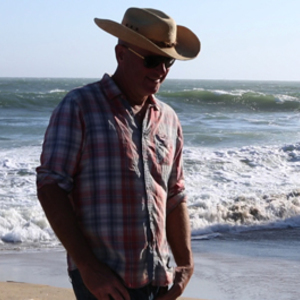 A stunning San Francisco Bay area sea cove is the setting for this episode of Moveable Feast with Fine Cooking. 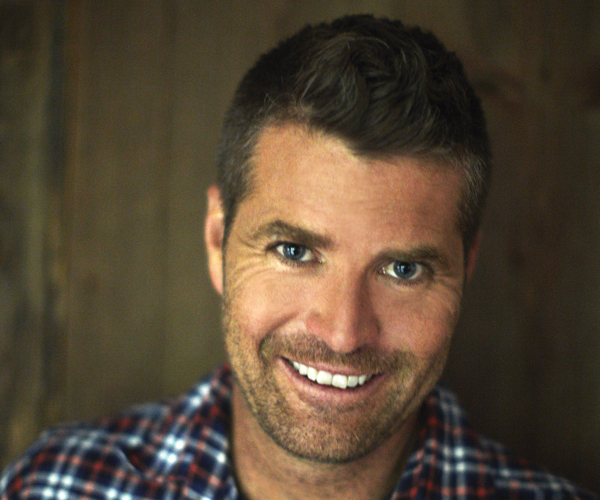 Host Pete Evans visits Outstanding in the Field, a “restaurant without walls” (founded by Jim Denevan in 1999) that brings the dinner table to the source—farms, gardens, mountaintops, islands, ranches, and even sea caves. 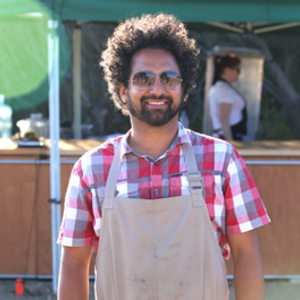 Guest chef Ravi Kapur knows there’s a world of challenges that goes along with cooking at the beach, but also has a sense of adventure and fun. The guests literally soak up the atmosphere as the Pacific laps at their feet and they indulge in one spectacular seaside feast of King salmon prepared two delicious ways, smoked pork shoulder plus a wide array of sides and salads all made with locally-sourced ingredients. I have met some characters in my time, and Jim Denevan ranks right up there as one of the most colorful. Jim is unique in that he walks the walk and talks the talk. 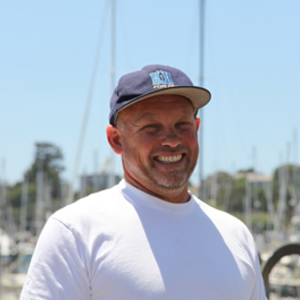 He had a vision for bringing farmers, chefs, and locals together for dinners that would connect the diners to their farming neighbors. From that initial thought, he has managed to create a touring dining phenomenon that is something to be very proud about. Working alongside chef Ravi Kapur was also a highlight for me. Ravi brings an almost Zen-like quality to his cooking; he is very thoughtful and completely in tune with his surroundings. He understands how to respect fresh ingredients and to elevate them with his skills as a chef. I can honestly say he is unique with his focus on the food being the star of the show. As for working on a beach with an incoming tide…well, I will leave that to your imagination and your viewing pleasure. 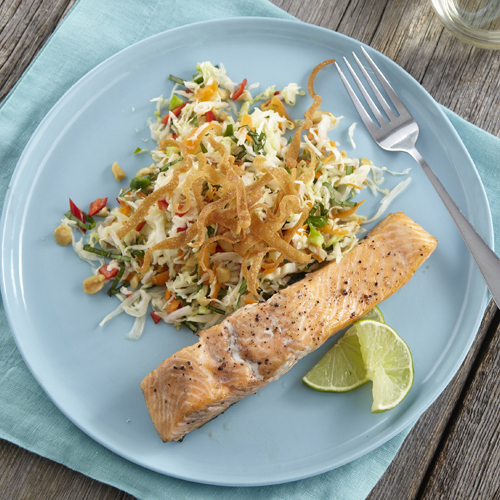 Shredded cabbage, Thai basil, peanuts, jalapeño chiles, and a Fresno pepper create a slaw that’s perfectly crunchy and bright with a bit of heat—just what a mellow-tasting salmon calls for. 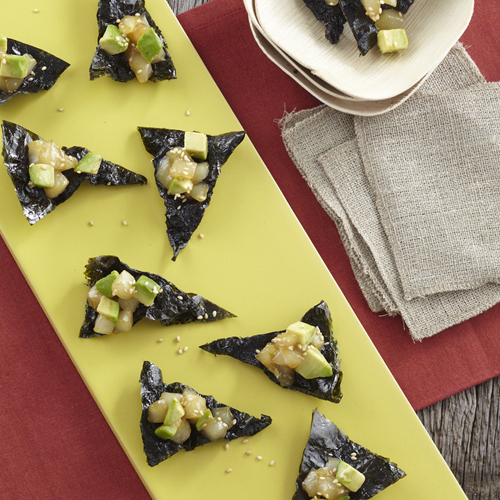 Nori breaks out of the traditional sushi role in a crisp fried version that blends its unique sea flavors with the ultra-fresh halibut and smooth avocado. 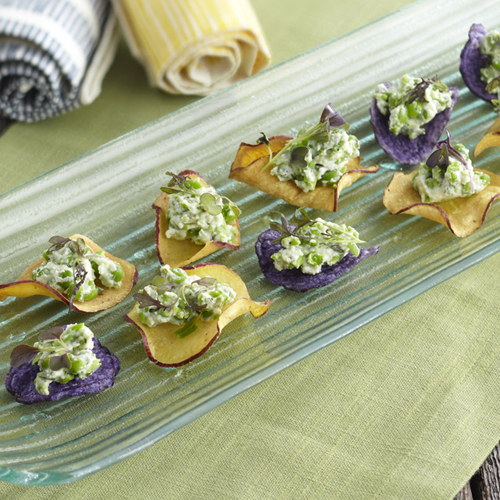 The lightness of fresh peas and ricotta makes this gently herbed appetizer satisfying but not filling, and turns the notion of heavy chips and dip on its head.